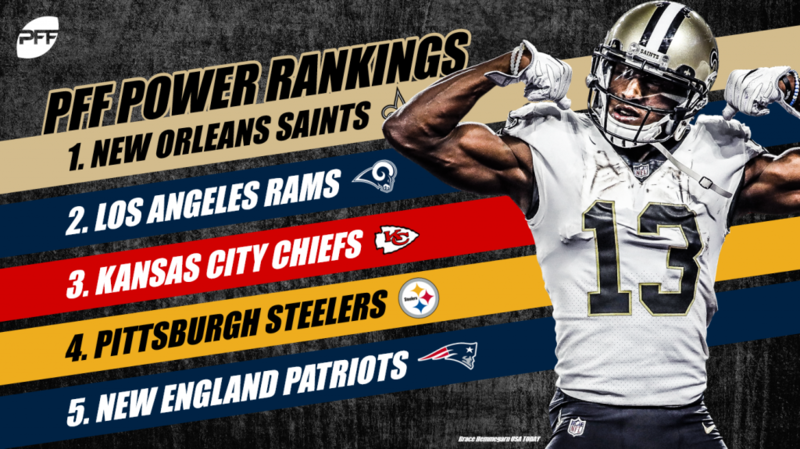 New Orleans showed why they are the top-ranked team in our PFFELO rankings with a dominating performance against last year’s super bowl champions. Drew Brees looks like the best quarterback in the NFL with over 30% of his throws receiving a positive grade; he has severely limited any opportunity the defense has by throwing a turnover-worthy throw on less than 1% of attempts. At 26% they are our clear favorites to win the Super Bowl having over a 9% greater chance than the next closest team. The Rams check in at No. 2 after a wild Monday night shootout against the Chiefs. Very clearly the best regular season football game this year, the new look NFL was on full display, as the two teams combined for 105 total points. The Rams have the highest expected win total in the NFL and therefore our favorite to secure the one seed in the NFC playoff race. Jared Goff is by far the most valuable player on this team posting a 4.84 WAR. For comparison, Todd Gurley ranks seventh on this team with .43 WAR. The brilliance of Patrick Mahomes and Andy Reid was on full display on Monday night. Despite eventually losing to the Rams, the Chiefs have to have full confidence in their ability to win in a subsequent matchup. With two remaining matchups against the Raiders, the Chiefs are clearly in the driver’s seat to secure the top AFC playoff seed. Mahomes has provided 5.28 WAR with a big-time throw on 6.7% of attempts, both ranking second in the NFL. Pittsburgh took the unorthodox approach of not even showing up for the first half of their game against the Jaguars on Sunday, but after a frantic finish, they emerged victorious as Big Ben stumbled into the end zone for the go-ahead touchdown. Big Ben has to play better down the stretch if the Steelers want to remain in the Super Bowl conversation. Currently, 16.4% of his throws have received a negative grade, which is the fifth-highest mark among active starting quarterbacks. After stumbling into their bye with a glaring loss against the Titans, the Patriots look to right the ship heading to the Meadowlands as 9.5 favorites on Sunday. PFF Greenline likes the Patriots to cover the spread, projecting they win by 11.5 points. Trey Flowers has been a standout for this defense entering the elite ranks of defensive ends with an 89.9 grade; he has generated 35 pressures, 25 run stops with only 1 missed tackle. The Chargers let the Broncos linger in the game for far too long on Sunday and ended up losing on a last-second field goal at home. Despite the hiccup, the Chargers are very much in control of their playoff situation with an 82% chance of making the playoffs. Philip Rivers may be having the best season of his career with an EPA per dropback of .28 and a PACR of 1.13, both ranking third in the NFL. He has generated 3.55 WAR. 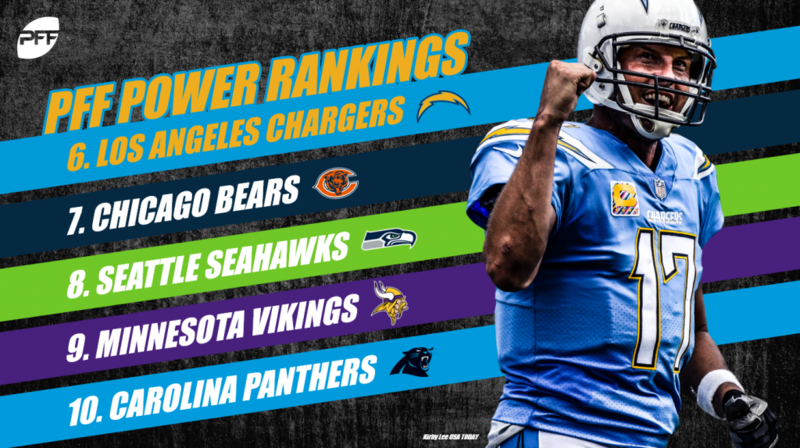 With key matchups still remaining against the Steelers and Chiefs, the Chargers will have the opportunity to show where they stand in the pecking order of the AFC. The Bears continue to win due to the strength of their impressive defense. There is little reason to try running against the Bears, as they have allowed a successful rush on 28% of early down attempts. The injury to Mitchell Trubisky doesn’t appear to be as significant as first thought and, staying on brand, his presence isn’t exactly the distinguishing characteristic that is causing this team to win ball games. With an 87% chance of making the playoffs and a 64% chance of winning the NFC North, the Bears are firmly in control of their own destiny heading into December. The Seahawks finally closed out a quality win against a tough rival on Thursday Night Football. This week, they travel across the country to take on another team that they are competing with for a wild-card berth in the NFC. With a 43% chance of making the playoffs, the Seahawks will need Russell Wilson to continue to be extraordinary to give them a chance at winning on Sunday. In 2018, Wilson leads the NFL with a big-time throw on 8.5% of his dropbacks. He is putting together another MVP type of season generating 3.01 WAR. The Vikings let a significant opportunity to separate themselves from the rest of the NFC North slip away in their Sunday night loss to Chicago. Kirk Cousins hasn’t exactly elevated the performance of this offense, generating -.01 EPA per dropback in 2018. Only 21.1% of his attempts have received a positive grade. For comparison, that is only one percent higher than Alex Smith and Blake Bortles. Dalvin Cook has been hit at or behind the line of scrimmage on over 60% of his rush attempts. The Panthers dropped their second consecutive game after failing to convert a two-point conversion with one minute to go. The Panthers are still in the driver’s seat to secure a wild-card berth with a 44% chance of making the playoffs. Cam Newton continues to have a higher percentage of turnover-worthy throws than big-time throws, but an encouraging view is almost 30% of his attempts have received a positive grade. He is making good throws just not great throws and has occasionally mixed in an errant throw worthy of being picked off. Still, he has generated 2.06 WAR, one of the highest marks in the NFL. Defensively, this team is struggling, allowing 51% of early down pass attempts to be successful from an EPA standpoint. The Eagles hoisting the Lombardi Trophy less than a year ago feels like a distant memory after their 48-7 loss at the hands of the Saints. At 4-6, the Eagles have two games still against the Redskins and one against the Cowboys, which could allow them to sneak back into the NFC East discussion. They will need to play much better than they have of late, as their playoff odds have dwindled to a mere 18%. Carson Wentz has to improve on his EPA per dropback of .02 if they want to realize their slim chances of defending their Super Bowl title in this year’s playoffs. It is officially Lamar Jackson season in Baltimore. In his first NFL start on Sunday, Jackson had 51 offensive snaps and recorded a rushing attempt on 24 or 47% of his snaps. Baltimore’s defense has struggled as of late but is still the best in the league at limiting plays after the catch. They have the lowest rate of yards allowed after the catch per attempt in the NFL. Early down pass coverage has turned into a struggle, as they are allowing 47% of attempts to be successful. How ’bout them Cowboys?! After beating Atlanta on the road, the Cowboys head home for a showdown with the Redskins, a game that could easily decide the NFC East. Right now, the Cowboys have a 43% chance of making the playoffs with a 29% chance of winning the NFC East. That is not taking into account the injury to Alex Smith. With Dak chipping in 1.28 WAR, the pieces are in place for the Cowboys to reclaim the division crown in 2018. The Falcons mounted a frantic fourth-quarter comeback but couldn’t come up with a stop late against the Cowboys. Atlanta made an inexplicable decision to kick a field goal on fourth and goal from the three-yard line playing for the tie because for some unexplainable reason making it to overtime feels like a small victory for some NFL teams. Atlanta has around a 16% chance of making the playoffs, but with road games against the Saints, Packers and Panthers still ahead, those odds could diminish quickly in games they have to find a way to win…not tie. Mike McCarthy continues to play the numbers, but no one is quite sure what math he is utilizing, as his in-game decision making continues to hinder this team. The Packers are 0-5 away from Lambeau this year and look like a completely different team in their home vs road splits. They have around an 11% chance of making the playoffs with tough road games still to come against the Vikings and Bears. If they waste another year of Aaron Rodgers‘ prime, the blame will fall directly on McCarthy’s shoulders. The Colts doubled their chances of making the playoffs (30%) with a dominating win against the Titans. Andrew Luck once again looks like one of the best quarterbacks in the league with only one turnover-worthy throw over his past four games. Despite the big plays this offense generates, Luck hasn’t benefited much from his receivers picking up yards after the catch, as he has the third-lowest yards after catch per attempt in the NFL. Woof. The Titans are probably the league’s most enigmatic team, exemplified by a blowout loss last week against an upstart Indy team in which Marcus Mariota had to leave with an injury. They play in Houston Monday night, and while they were able to defeat the Texans without Mariota in Nashville in Week 2, they’ll likely need Mariota and his 27.3 percent positively-graded throw rate to complete the sweep in front of Tess, Witt and Boog. I don’t think there has been a weaker team in NFL history to go on a seven-game winning streak. 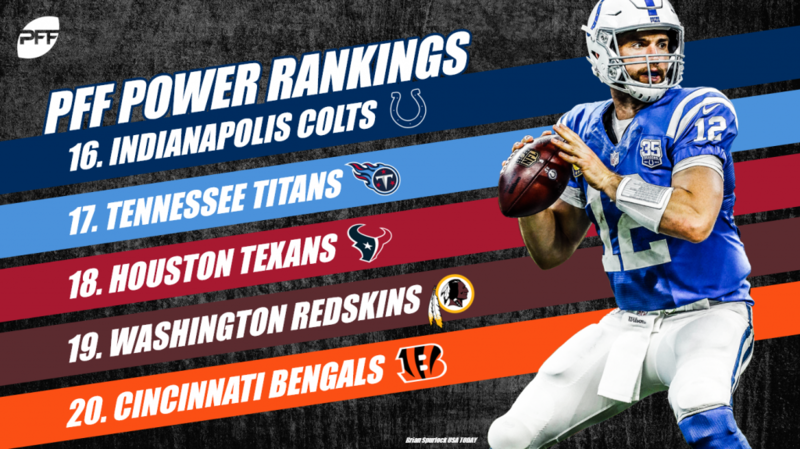 However, here we are, and in terms of potential moving forward, it’s hard to sleep on what Deshaun Watson (second among full-time starters in rate of positively-graded throws) and DeAndre Hopkins (second among non-quarterbacks in WAR) can provide for a team with one of the league’s easiest schedules ahead. While the Alex Smith loss is crushing for Washington, he hadn’t exactly been the reason they were winning football games, generating a positively-grade throw on just 20.1% of his dropbacks. 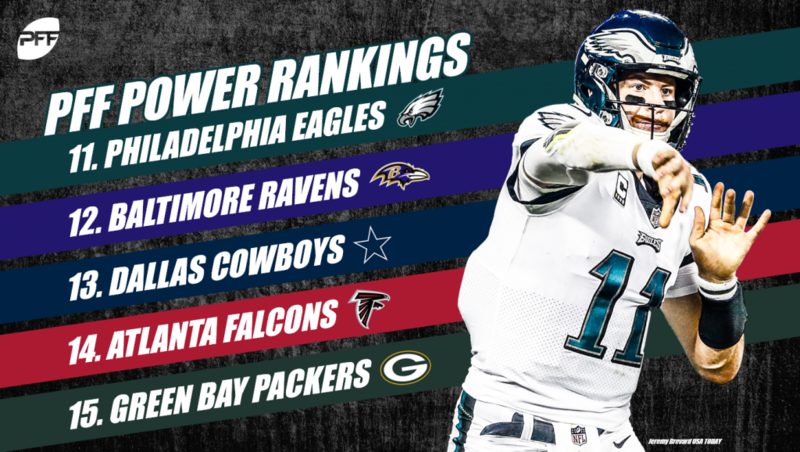 We have Washington still winning the NFC East in roughly three-fifths of our simulations, as a win this week in Dallas plus a split versus the Eagles would likely do the trick. What was once a promising season for our hometown Bengals has them hoping to leverage one of the league’s easier schedules moving forward to get them back in the playoff hunt. We have them with a 20.9 percent chance to make the playoffs after Week 11, and winning what we have as basically a 50/50 proposition at home against the Browns is a crucial first step towards that end. Right when you think it’s time to completely fade a team, they practice outdoors in the snow and allow the other team to completely miss a wide-open two-point conversion for a win in their home stadium. Jokes aside, the Lions have an opportunity to move to 5-6 Thursday against the Bears with Trubisky hurting. 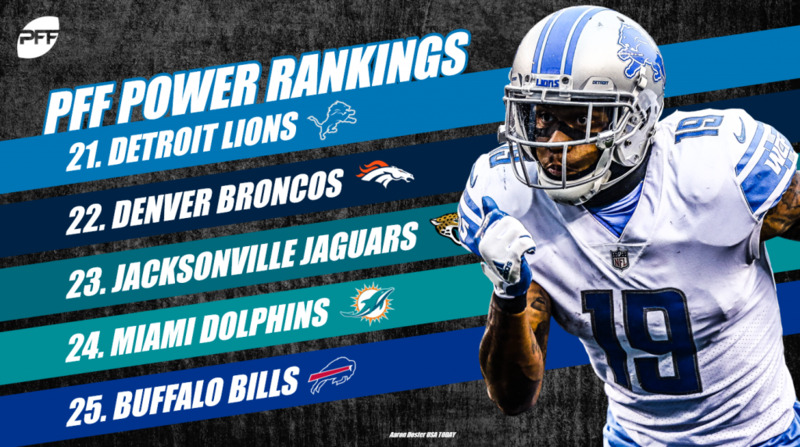 To do so, they’ll need to continue to see the rise of one of the league’s next great wide receivers, Kenny Golladay (113.6 passer rating into his targets so far this year). Great job, Vance. Sentence over. The Broncos won a close game in Los Angeles Sunday on the back of a running game that averaged 5.7 yards per carry and a defense that pressured Rivers on 15-of-46 dropbacks. A big six weeks are coming up for the future of Case Keenum and Vance Joseph in Denver, which will be interesting to monitor going forward. In a classic example of defense regressing, the Jaguars fell to 3-7 Sunday with a heartbreaking, last-second loss to the Pittsburgh Steelers at home. Star cornerback Jalen Ramsey had himself a day against Pittsburgh and is currently allowing only a 70.4 passer rating into his coverage through the season’s first 11 weeks. This is the lowest rating of any team with a legitimate chance to make the playoffs at 5-5. With Ryan Tannehill returning, there is something to look forward to for Adam Gase’s bunch, who have suffered through a Brock Osweiler phase that saw more than twice as many turnover-worthy plays as big-time throws during his time as the fill-in. The Bills come out of the bye with three wins under their belt and have some profoundly winnable games coming up with the Jaguars, two dates with the Dolphins and games against the Jets and Lions. To win some or most of these games, they’ll need to continue to be great defensively, where they have allowed only 0.04 EPA on early down passes and -0.19 on early down runs. 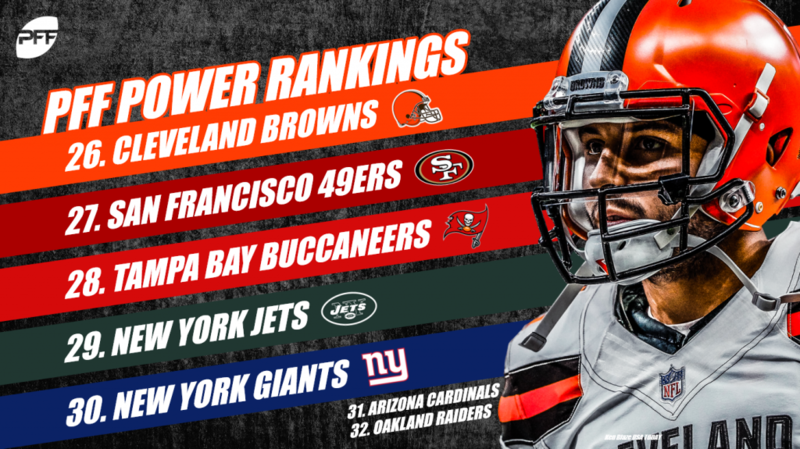 The Browns are coming off of a bye with a real opportunity to win their fourth game (but first on the road) this week against their in-state rival, the Cincinnati Bengals. PFF Greenline has the Browns with roughly a 50/50 chance in this game, possessing what is likely (even today, but certainly in the future) the better quarterback with Baker Mayfield and his 5.39 percent big-time throw rate. The Niners come off of a bye this week against the Buccaneers on the road in a big spot for Nick Mullens, as he tries to establish himself as a long-term backup option for Kyle Shanahan’s bunch. Shanahan has put Mullens in great spots in his first two starts, a trend that should allow them to put up substantial points against a weak Tampa defense allowing a league-worst expected points added on early down passing. The Buccaneers continue their swoon from a 2-0 team to the basement of the NFC South in no short part due to their putrid defense. Their 0.34 EPA allowed on early down passes is the worst in the NFL, giving Jameis Winston a lot to have to catch up to as he returns to the lineup this week against the plucky 49ers. What started out as a promising year for Todd Bowles’ squad has quickly fallen off – so much so that they are in a decent position for the number one pick (they are projected for 5.0 wins, versus 3.7 for Arizona). This would be big for them, as their trade with the Colts left them a little bare last year, meaning a trade back with a team looking for a quarterback could help them recoup capital for the future. Someone break up the Giants! Two weeks and two wins for a team that looked destined for 3-13 has us a little nervous about our under 7 projection going into the season. They go to Philly this weekend for their rematch, and we have it as 30/70 proposition for the G-Men. The Cardinals made a power move in their quest to obtain, and hopefully hold for trade ransom, the number one pick in the 2019 NFL Draft by losing to Oakland at home Sunday. Josh Rosen threw two early interceptions, which have him sitting at -0.29 EPA per dropback this season, the worst among league qualifiers. The Raiders got off of their losing streak Sunday in Arizona, winning on a Daniel Carlson field goal as the regulation bell rung. The win did not overshadow the fact that they are one of the league’s two worst defenses, allowing an astounding 0.30 EPA on early down passing plays.